I woke up bright eyed and bushy tailed this morning with a huge bounce in my step and a smile on my face; why, you ask? Because I can count down the days until Lightning in a Bottle on my fingers and toes! As of today, there are only 15 days left until my favorite music festival; 15 days until I leave the ‘real world’ of Monday through Friday, 9 to 5 jobs that leave us yearning for some semblance of self satisfaction; 15 days until I cruise up to the San Antonio Camp Grounds up on the Central Coast of California for a weekend of fun, sun, beautiful people and wonderful vibes. After last year’s amazing experience at Lightning in a Bottle, I’ve been blessed with the opportunity to cover the event for The DJ List and I couldn’t be more thrilled. So, with 15 days left until the big weekend – I give you the 15 acts you have to see. Back when I first set eyes on the LIB’14 flyer, I recognized less than half of the artists on the bill – which is better than last year’s lineup, where I probably knew about a third of the acts pre-festival. In an effort to educate my eardrums, I decided to start from the bottom right corner where the lesser known acts resided and work my way up to the top where mainstream headliners like Moby, Phantogram and Little Dragon sit comfortably. Beyond the fact my taste in music has evolved over the last year, what I realized while winding myself through the lineup is that there’s just so much good music out there to discover for everyone. 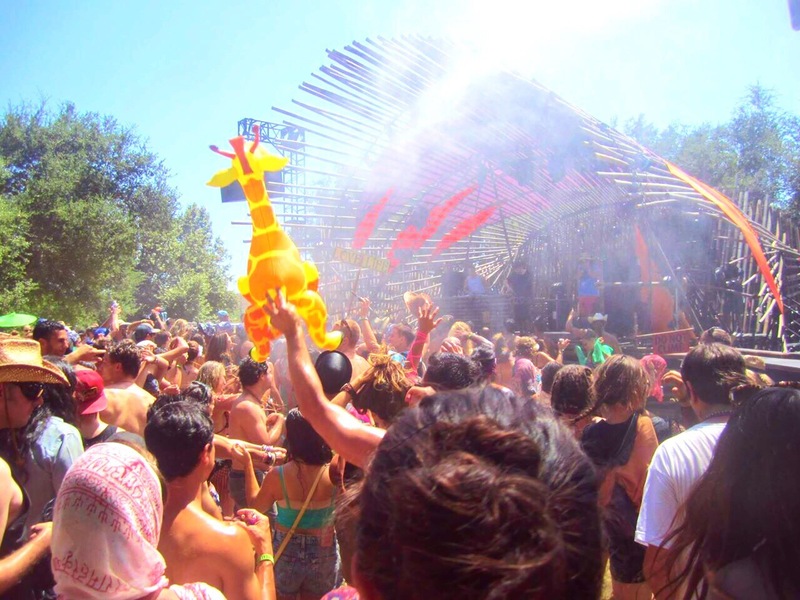 From Goa and Psy-Trance to Ambient Chillscapes, Glitchy Dubstep to Liquid Drum and Bass, and Funky Deep House to Nu-Disco Soul Music – this year’s lineup for Lightning in a Bottle absolutely has something for everyone’s taste in music. When I started rummaging through the line-up, I had no idea that my plan to make it from bottom to top in a day at the office would be thwarted. Not by the fact I had a meeting, or a heavy workload – but because third from the bottom is Late Night Radio and once I started listening, I simply couldn’t stop. Even though my heart has found it’s way into an EDM groove over course of the past decade, Hip-Hop and Rap have a way of speaking directly to my soul – and that bassline, oh, that bassline – it most certainly was the gateway drug that converted me to Electronic Music. So, when I started grooving to the Vinyl Restoration series from LNR – I was absolutely sold. Known to friends as Alex Medellin, LNR effortlessly blends ambient Electronic instrumentals with a Neo-soul, Hip-Hop groove – and the result is absolutely insatiable. Hands down, he’s my #1 Must See at LIB. Admittedly, I’m a sucker for remixes – reworks, really – if you want to get down to brass tax. There’s a guy on Soundcloud who goes by Virgin Magnetic Material and he’s known for his masterful mix downs of hit songs. My first Tourist track reminds me of VMM in the best of all possible ways – it was ‘Your Girl’, a rework of the 90’s song from Aaliyah. The more I tore into his discography, the more I fell in lust with his downtempo, melodic and sometimes eerie, Deep House vibe. One of my personal favorites right now is ‘I Can’t Keep Up’ featuring the vocal stylings of Will Heard; it’s absolutely breathtaking. Even though TPA is half of Wildlight, it’s difficult to put them into the same category of music – unless that category is called: awesome. The Polish Ambassador excells at working the festival crowd and has made a name for himself through his funky fresh remixes of jams like ‘No Diggity’ and ‘Girl Control’; Wildlight, on the otherhand, is a side project with the amazingly talented Ayla Nereo that fuses her ethereal voice with earthy instrumentals, creating what I can only describe as World Music that your parents could appreciate. They’re two drastically different sounds, but they’re equally moving – and I highly recommend catching both. Ask anyone who’s attended any All Day I Dream event, and they’ll all gush the same thing: Lee Burridge is an expert at throwing day parties. From the beautiful vibes his smile elicits, his “Get Weird” attitude, right on to the lovely house grooves coming off the decks – Lee’s Sunday set will undoubtedly attract all of the Deep House fanatics at LIB. My first Slow Magic discovery was the song ‘Youth Group’ – a synth heavy, melodic anthem that makes you want to stomp around. Since then, I’ve been dabbling in all things SM and it’s been getting me really amped for their set! A few Summers ago, I had what I’d like to call a ‘Love Affair’ with Deep House. It was perfect for lazy Summer days by the pool where you didn’t want to move an inch, or lazy Sunday afternoons where you were soaking in memories of the weekend. But at the time, what Deep House didn’t do for me was move my body. Thank goodness my friends introduced me to Maxxi Soundsystem. Their music is an infectious, rumbling journey into the melodic side of deep house – trust me when I say you won’t be disappointed. Back a few months ago at King King, I got my first introduction to Random Rab and immediately, I was hooked. Most music – I can describe fairly well, but Random Rab provides almost meditative, downtempo soundscapes that you can drift into a daydream with. I have an incredibly vivid memory from How Sweet It Is ’09 – Fedde Le Grande was headlining the Main Stage, but because of capacity issues – officers on horseback ushered us away from the main tent and told us to find another stage. Keep in mind, this is when I was firmly planted in Electro House and Progressive Trance – and the thought of going to the Neon Gardens or Bass Pod at the time almost terrified me. Immediately, some fast friends of ours noticed our shift in mood and announced that they were going to introduce is to something magical and mindblowing. As we shuffled into an almost empty tent, our ears were full of live instruments and MCs – it was all so brand new, so exciting and so beautiful. Between SHY FX, Booka Shade and Kraak & Smaak – I was introduced to so much good music that night that’s since then, heavily influenced my life. Their epic hit ‘Squeeze Me’ gives me goosebumps to this day; I can’t wait to see K&S again now that I’m familiar with their catalog. If you’re opening for Shpongle, chances are – your music is insanely progressive. When Shpongle graced the stage at Avalon last month, they brought friends and fellow Goa/Psy Trance aficionados Desert Dwellers with them as their opening act and it was absolutely perfect. Slightly more downtempo than Shpongle, DD creates gorgeous ambient soundscapes that you can effortlessly lose yourself in but with just enough bass and harmony where you can dance to your heart’s content. Hands down, Pumpkin was one of my top five sets from last year. I have to hand it to the Gent, he really knows how to get the crowd movin’ to the music. A Los Angeles local, Pumpkin’s been in high demand within the festival circuit at Coachella, Sea of Dreams as well as Lightning in a Bottle over the years. Just take a five minute peak into his set at LIB and you’ll more than see why! Dimond Saints is the brain child of Trip-Hop phenom An-Ten-Nae & friend ReLeece. For the last few months, they’ve been pushing hit after hit out to the Hypem charts and I’m really diggin’ what I’m hearing them put down. An-Ten-Nae threw down one hell of a set at Sea of Dreams as LowRiderz with Laura Low and has more then proved himself as a versatile artist and producer. He’s definitely going to be one to watch over the next few years. The first time I heard of Thriftworks was through the Sea of Dreams lineup, and now I just can’t get enough of him. Somewhere in between the down-tempo Glitches and Trip-Hop beats, I lose myself in the music; some Thriftworks in the afternoon sun sounds simply perfect. One thing’s for sure – there ain’t no party like a Dirty Bird party, cause a Dirty Bird party don’t stop! On NYE at Sea of Dreams, I saw Worthy and J.Phlip hold it down for the Dirty Bird crew – and now, I’m excited to see the Big Papa of the crew back on the decks! I saw him at Avalon back in ’12 and I’ve been itching to see him ever since. J.Phlip will also be in attendance for LIB, fingers crossed we’ll see some back to back Dirty Bird action goin’ down at the Woogie stage! The first time I saw Beats Antique was back in ’08 when they opened for Bassnectar at the El Ray; that was right around the time that my mind was expanding exponentially with new music. No longer was it just House and Trance for me; all of a sudden – there were new, glitchier, funkier, grimier, more industrial sounds to explore – and Beats Antique was my first real introduction to them. At the time, I called it ‘great music to ride a horse to’ and while slightly ignorant, I still hold to my statement; Beats Antique elicits a bohemian bazaar feeling that immediately transports me back hundreds of years with their ‘World Music’ inspired sounds. Tickets for Lightning in a Bottle are selling like hot cakes, so be sure to get yours now before they’re sold out – this is one weekend you don’t want to miss out on; trust me, I’m a festie.